Pianist and composer Theo Hill, a native of Albany, New York, first studied jazz piano with the late (and, in her neck of the woods, legendary Lee Shaw (1926-2015). After graduating from the Jazz Conservatory at SUNY/Purchase, Hill moved to New York City. Slowly yet steadily, he has built quite the resume working with drummer Jeff “Tain” Watts, trumpeter Wallace Roney, vocalist Gregory Porter, and many others. He has recorded with trombonists Frank Lacy and David Gibson; currently he holds down the piano chair in the Mingus Big Bang and with T. S. Monk. His debut album. “Live at Smalls“, came out on SmallsLIVE in 2014 and featured a quintet. Hill now records for Posi-Tone Records which released his label debut, a trio date titled “Promethean“, in May of 2017. 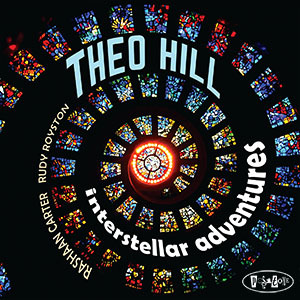 Hill’s new Posi-Tone recording, “Interstellar Adventures“, features the first-rate rhythm section of Rashaan Carter (acoustic and electric bass) and the sublime Rudy Royston (drums and percussion). The ensemble alternately dances, roars, pounds, caresses, and glides its way through a program that includes five Hill originals plus five songs by composer/performers you could say are the pianist’s influences and musical mentors. “Promethean” only had one original amidst the 11 tracks, with two composed by the late Kenny Kirkland. You can hear the influence of that pianist’s appealing ballad “Revelations” as well as on Hill’s originals, such as the title track. It’s in the turn of a phrase or the attack at the beginning of the solo; not overt but there. Hill also covers Marcus Miller’s “For Those Who Do” and one can hear how his flowing lines show that pianist’s influence. Instead of looking and listening for influences, dig into the music itself. The trio shines on Tony Willams’s “For Those Who Do“, a fiery number that flies forward on the propulsive bass lines and the thunderous drums. Hill taps into those energy sources, builds on its intensity, and delivers a stunning performance. Sam Rivers’s “Cyclic Episode” may start in a gentler fashion but soon builds up its own head of steam. This time, it’s Royston responding to Hill’s flying fingers and matching him phrase for phrase, power to power. Carter’s bass is the foundation but he really captures the intensity. Hill moves to electric piano and Carter to electric bass for a romp through Jan Hammer’s “Thorn of a Wild Rose“, a tune the composer recorded with both Charlie Mariano and Elvin Jones. The thick bass groove, the delightful cymbal work, and the leader’s strong piano work give the song a real lift. Hill’s originals shine as well. After an introspective opening statement, “The Comet” thunders out on the power of the pianist’s left hand (a hint of McCoy Tyner here), Carter’s intelligent bass work, and Royston’s percussive storm. It’s breathtaking music at any volume but, played very loud, might just bring down walls. The album closes with “Enchanted Forest” with both Carter and the pianist going “electric.” The bassist gets the first solo, showing a melodic side to his obvious impressive technique. Hill approaches the electric piano in a different manner, somewhat quieter, and enjoying the sonic capabilities of the instrument. It’s a placid finish to an imposing program. The interaction of the three musicians, the intelligent compositions, and knowing the strengths of the rhythm section, all that and more makes “Interstellar Adventures” worth listening to again and again. Theo Hill is making the most of his many and varied collaborations and sideman gigs, maturing before our very ears. Going to be exciting to see and hear how he continues to grow.